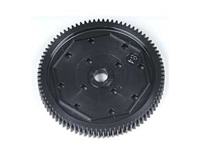 This metal cup joint for the DB02's center drive shaft replaces the kit-standard plastic part to provide increased durability and power transmission efficiency. Note: Requires 4pcs. for one car. Spare B parts tree for the DB-02 chassis. 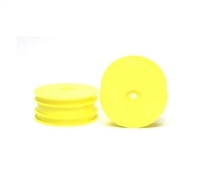 Compatible with DB-01, TRF511, TRF502 and TRF501X machines. Spare M parts tree for the DB-02 chassis. 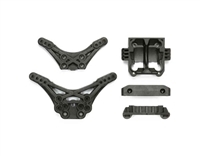 These precision aluminum rear suspension mounts replace the kit-standard plastic N3 part to enable toe-in angle adjustment. 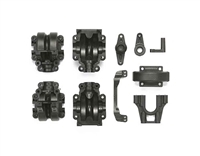 They also contribute to secure holding of the suspension arms, offering greater durability on the suspension system. 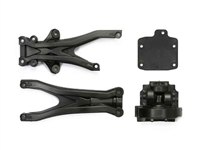 These precision aluminum rear suspension mounts replace the kit-standard plastic N3 part to enable toe-in angle adjustment. 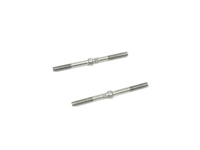 They also contribute to secure holding of the suspension arms, offering greater durability on the suspension system. 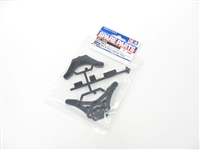 Compatible with DB02, TRF502X chassis. 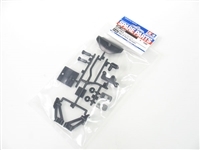 The kit included front damper stay on the DB-02 chassis is made of durable fiberglass reinforced plastic. This new carbon plate material shock tower provides you with a more rigid suspension set up and it will enhance the effectiveness of your suspension changes. 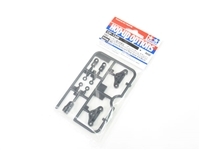 Use in place of the M1 resin parts that come as kit-standard. The carbon stay is made of carbon fiber plate and measures 3.5mm thick. These Carbon Rear Stiffeners replace the kit-standard plastic parts to offer increased rigidity to the rear section of the DB02 chassis. 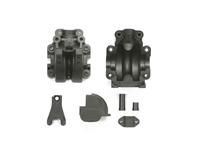 This durable 3.5mm thick carbon damper stay replaces the kit-standard plastic part to increase attachment rigidity for optimum damper effect. It also has damper attachment holes that are higher than the kit-standard positions to enable a wider ground clearance adjustment.